This article and its photos are reposted from the United Methodist Church's media page, under the heading "Transgender Pastor Urges Sexuality Debate". Rev. David Weekley, whom I met at the Philadelphia Trans-Health Conference in 2009, is one of at least two ordained transgender ministers in the United Methodist Church. The Rev. 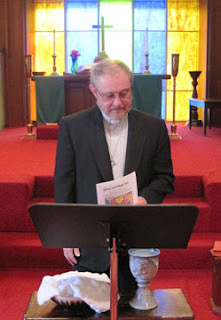 David Weekley prepares the elements for Holy Communion on his first Sunday morning at Sellwood United Methodist Church in Portland, Ore. A UMNS photo by Tina Todd, Sellwood UMC. The Rev. David Weekley thinks it’s difficult for the church to have meaningful conversations about sexual and gender identity. So, for years, the Portland, Ore.,-based United Methodist pastor, husband and father of five kept his own secret about having been born a girl but never feeling like one. Then, on Aug. 30, 2009, he decided it was time to start telling the story of his experience as a transgender man, beginning with his own congregation. Now, Weekley wants to widen the discussion about sexuality throughout the denomination, despite what he perceives as an increasing reluctance to discuss such issues. The recent refusal of the United Methodist Judicial Council to reconsider its 2005 decision upholding a pastor’s right to reject someone as a member of his church is an indication of the urgent need for conversation, he said. He has even written a book about his own experience, now in the final editing stages, which he hopes can be used as a conversation starter once it is published by Wipf and Stock of Eugene, Ore. Some church members believe there has been more than enough conversation on the topic. The Rev. Thomas Lambrecht, a United Methodist pastor from Wisconsin and a representative of Good News, an unofficial United Methodist evangelical caucus, said “the continued focus on sexuality issues” is a reflection of western culture rather than a theological imperative. “What we need to focus on is becoming disciples of Jesus Christ and living that out in a variety of ways,” he added. Conversation, however, can take issues of sexuality out of the cerebral and into the personal, says the Rev. 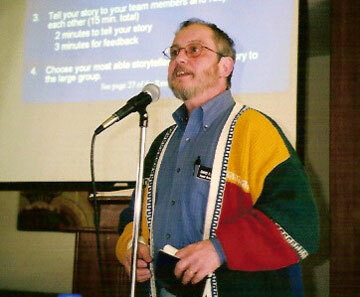 Troy Plummer, executive director of the Reconciling Ministries Network. While some segments of society, as well as some churches, are having those conversations, “it mostly feels like the church wants to avoid conflict and discomfort” on issues of sexuality, he noted. Such discomfort is familiar to Weekley, one of the few transgender pastors in The United Methodist Church. The denomination’s book of law currently has no prohibitions against ordaining transgender persons, and Weekley remains in good standing with the Oregon-Idaho Annual (regional) Conference. His own transformation – from female to male and from alienated Christian to ordained pastor – began in 1972, when the 21-year-old started the gender-reassignment process at University Hospitals in Cleveland. After completing the medical transition in 1975, he attended graduate school at Miami University of Ohio and started searching for a faith community. Walking into a United Methodist congregation in Oxford, Ohio, and, like John Wesley, finding “my own strange warming of the heart experience there” on World Communion Sunday was the first step in Weekley’s faith journey, he recalled. Volunteers from the Sellwood United Methodist Church and community cleaned the church kitchen in preparation for the Northwest Gender Alliance Thanksgiving Dinner. A UMNS web-only photo by Tina Todd, Sellwood UMC. The journey took him from serving as a volunteer at the campus ministry center to studying at Boston University School of Theology to beginning the ordination process in 1982. He became an elder in the Oregon-Idaho Conference in 1984. Weekley said he never buried his former identity, but often wrestled with the issue of when and how he should share his story. 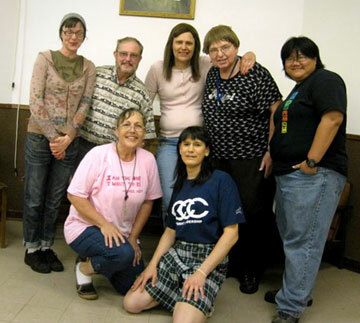 A 2008 pilgrimage to Minidoka, a World War II internment camp in Idaho – with members of Weekley’s mostly Japanese-American congregation at Epworth United Methodist Church in Portland – made him start to think it might be the right time to go public about being a transgender man, especially since his children were now young adults and able to understand it. Indeed, the congregational support was immediate. “The day of the service, people broke into applause at the end of my message.” Later, however, a small group of members seemed to complain more often to him. “I was never sure whether it had to do with my being transgender and sharing that … but it eventually led to my decision that it was best to move,” he said. Today, Weekley appreciates being in a two-point charge – Sellwood and Capitol Hill churches in Portland – where members were aware of his transgender identity right from the start. Weekley was disappointed when the denomination’s top court declined to reconsider Judicial Council Decision 1032 at the end of October. Decision 1032 stated that a United Methodist pastor has the right to determine local church membership, even if the decision is based on the person’s sexual orientation. photo courtesy of Deborah Maria. While he understands not wanting to usurp the authority of the pastor, “when I think about the bigger picture, I wonder if the case would have been the same if it had been about ethnicity or race or gender,” he said. “As a pastor, I can’t imagine telling someone who wants to be part of our faith community that they weren’t welcome,” he added. Evangelicals are satisfied with the church’s current positions on human sexuality, he said, but he expects that efforts will be made to change those positions at the denomination’s 2012 legislative assembly. “The continued discussion of this issue, we feel, detracts from focusing on more important issues like the Call to Action report and the movement of encouraging vital congregations,” Lambrecht said. The Reconciling Ministries Network, an unofficial group that advocates for United Methodists of all sexual orientations, filed briefs related to several of the petitions before the Judicial Council. Plummer argued on the organization’s website that undoing a judicial decision such as Decision 1032 falls within the bounds of the council’s work. “This intentional refusal to right an obvious wrong is the latest act of discriminating hurt directed by The UMC toward LGBT (lesbian, gay, bisexual and transgender) people,” he declared. Weekley wishes the denominational discussion on sexual identity would adhere more closely to the Wesleyan quadrilateral, which uses scripture, tradition, reason and experience as a basis for theological reflection. He believes the church is ignoring the current scientific research related to the issue of choice and the origins of sexual orientation and gender identity. “It seems that reason and experience are missing from this conversation,” he said.